For when fighting with soccer moms for a 3x3 plot of sand just isn't going to cut it. Summer is just around the corner, and what that means for L.A. is about five straight months of brilliant sunshine and body-temperature heat. 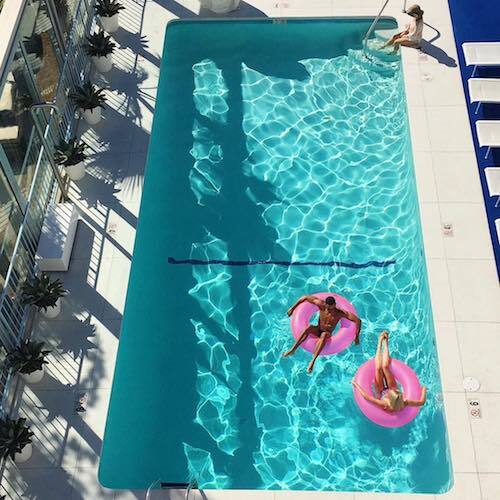 But if you’re not blessed with in-unit AC or a swimming pool in your complex (and going to the beach entails too much sand and being around too many other humans), may we suggest these six hotel pools. 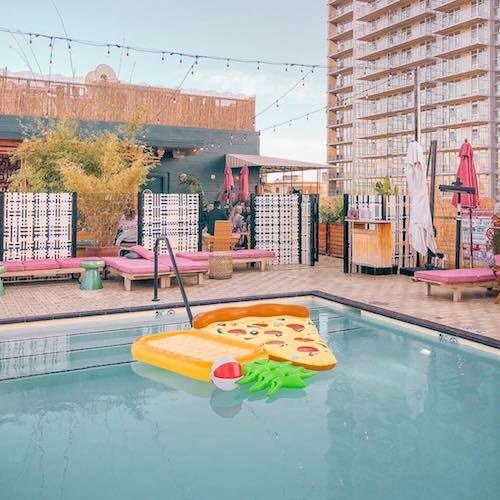 Now, we’re definitely not telling you to break into or trespass on these properties, but if you happen to be near one of these pools and you’re wearing your swimsuit and you just happen to fall in, well, it’s not the worst thing. 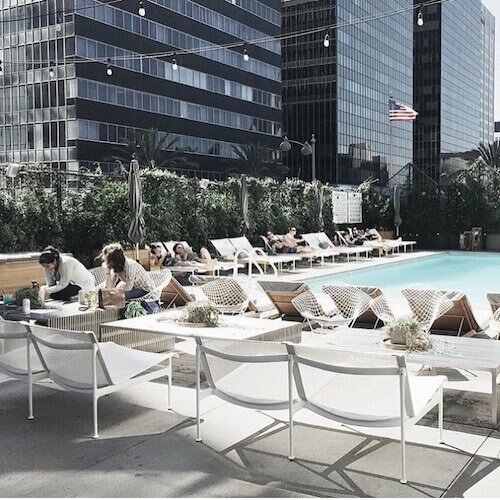 Few pools in LA are as stylish as the SLS’s. 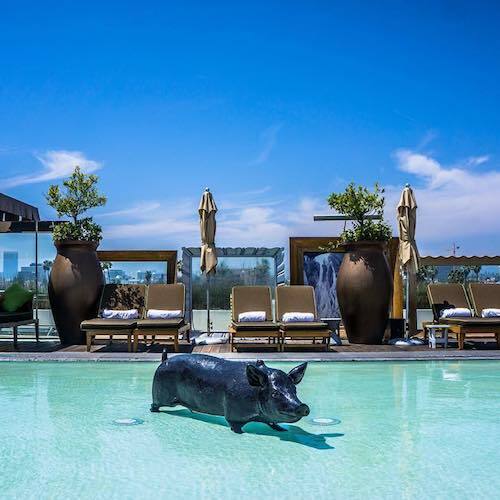 If you’re looking to see and be seen, this rooftop oasis near the Beverly Center is for you. There are rentable cabanas on hand, a drinks and snacks menu from José Andrés, and views from Downtown to the coast. Plus, who knows what celeb might be splashing around next to you. With the Fairmont, you can be right next to the beach without having to actually be at the beach. If the sea breeze doesn’t have you sold, this pool is surrounded by palms, quaint bungalows, and a poolside bar that’s the perfect cap to a day spent soaking up the sun. So while your friends are fighting a family of four from Fontana for a three-by-three spot of sand to stake their beach blanket on, you’ll be relaxing atop an inflatable flamingo floatee (or would you prefer the unicorn). It’s a quintessentially urban experience to be floating on your back at The Line’s second-story pool with a row of towers looming above. And yet, the experience is rejuvenating. Here, the jet-set mingle with locals, and the crew from the latest Korean Air flight to land at LAX takes a dip with the model in town for a fashion shoot. But you, you’re just here to take it all in, work on your tan, and sip a Pimp Cup cocktail from Roy Choi’s adjacent Commissary. The first perk of The Standard Hollywood is its adult-only rule. That’s right, your no-children-by-the-pool dreams have come true. While you’re enjoying your kidless bliss, you’ll get the best people-watching this side of the 101, ping pong, and globally inspired bites by Croft Alley. The Freehand rooftop looks like it was taken straight out of your favorite summer flick—we’re talking pinks and aquas galore. There are even some floats to post up on while you’re sipping a cocktail from James Beard Award finalist and winner of Tales of the Cocktail’s Best American Hotel Bar Broken Shaker. A great pool you don’t have to leave the Valley for? Tangerine has it. It’s low-key, retro chic, and you probably won’t have to worry about being caught in the middle of a pool party that ends with a Frosé spilled on you. Posh quarters in a 1921 venue with a spa, an outdoor pool & a chic restaurant with a communal table. 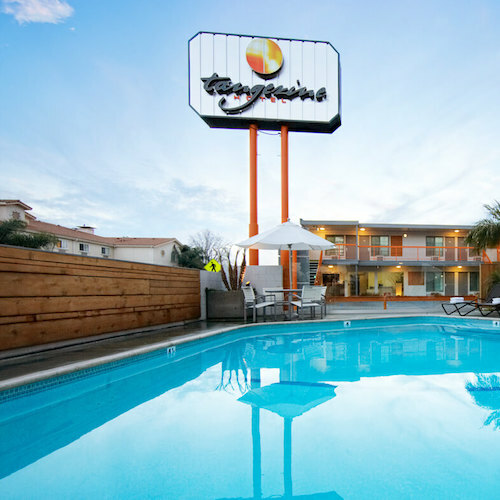 Chic hotel with a rooftop pool & beer garden, plus a 24/7 brasserie & nightly DJ music.